- Education expenditure is up by ~$10,000. Expect to remain stable next year. - Car insurance remained almost the same. However additional cost was two set of tyres (winter –summer) and annual service. 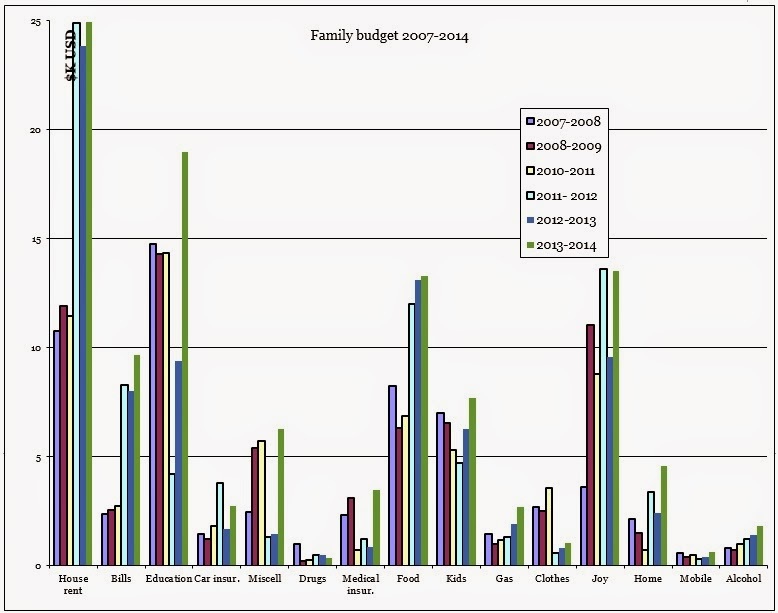 - Miscellaneous expenditure was up due to the administration expenses (~$4,000). - Medical bills are up (additional dentist cost ~$2,700). - Bills are up (electricity and heating are up, etc). - Home, after extended period of time we started renewing some of the furniture – bed, carpets. Additional electronics cost us ~ $3,200. - Joy – $4,000 extra in comparison with last year. Two separate week breaks cost us $9,600 this year, which is $,2700 more than last year on the holidays. Another $1,300 increase came from random miscellaneous expenses. - Spend more on clothes. We have been intentionally curtailing our demands but there will naturally need to buy some. - There will be no any additional administration expenses, dentist, less new things for home. Hopefully any entertainment expenses will go down by $2K as well. The plan is to stay under $100,000 a year. If you will pay closer attention, it could be noticed even percentage wise our consumption categories are changed. We are paying much higher price to maintain the same life style - house, car, food. This is not taking into account that the overall bill is much higher. 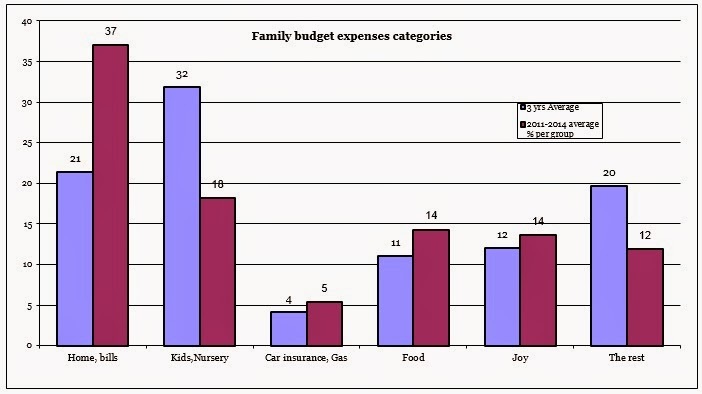 Main contributors are house rent, bills, education, home. In the first three years about 60% or $ 40K were essentials (home, bills, nursery, car, food) , second three years it was 70% or $ 78 K and hardly anything could be done about it. Admittedly we are renting a $650K house, so annual rental is about 4% of its cost. What is important, raising expenses puts additional pressure on the size of my next egg towards the financial independence. Initial goal was based on $65K expenses a year. At $85-$100 K a year I need to save at least $3 million to be independent. One of the possible solutions is to take on more work, I managed to get some additional days at expense of the rest time. It will compensate some of the expenses. I only see the money early next year and plan to invest them towards financial independence.